Will Bill C-51 turn ISPS into Internet Gatekeepers? My most recent column for the online technology section of Globe &Mail came out Tuesday. It is available here. the near universal adoption of usage based billing and bandwidth caps by Canada’s ‘big six’ ISPs — Bell, Rogers, Shaw, Quebecor, Telus and Cogeco — and now the mid-sized Atlantic region player, Bragg/Eastlink (although with some recent significant developments from Shaw). the fact that all of the major ISPs, except Telus, are vertically integrated and appear to be using usage based billing and bandwidth caps as a kind of ‘television business protection plan’ for their interests in the television industry. and finally, the focus of yesterday’s column in the Globe and Mail, the push from national security and law enforcement agencies to build in increasing monitoring and surveillance capacities into their networks, and to conduct ‘warrantless searches’ if proposed new legislation is passed. A fuller treatment of the issues covered in Tuesday’s column can be found in my earlier post here, and another that places things in a larger, global context here. In the last two weeks worries about the future of the Internet in Canada have been thrust into the spotlight. Thankfully, it is still going strong. The January 25th decision, in fact, would only affect 5 percent of Canadian Internet users. These are the ones who obtain access to the Internet from one of the nearly 500 small ISPs scattered across the country. The significance and symbolic importance of this group, however, goes well beyond its tiny numbers: if the UBB decision stands, they will be the last to have had unlimited Internet service replaced by a provider-controlled, pay per model of the Internet. Bandwidth caps and “excess usage charges” for everyone else, however, have been stealthily put into place during the past five years by an unholy trinity that involves the dominant telephone and cable players, a compliant CRTC, and the Harper Government. A succinct history of the emergence of UBB is essential to understanding the concept and just how it came to be such a unique (and undesirable) fixture of the Internet in Canada. Open Media offers a snapshot overview that covers the past year, but I think we must go back several years further. As early as 2000, the CRTC expressed its belief that user fees could be an appropriate tool for disciplining heavy users, but never acted on that belief. The Conservative Government’s ascent to power in 2006, however, marked a pivotal turning point. The radical remodeling of the Internet from an open, user-centric model to a provider-controlled, pay per model begins to be kicked into high gear at this point. This is primarily because the Government issues a slew of Cabinet Directives that required the CRTC to rely on “market forces to the maximum extent possible”, even though it is patently obvious that the Canadian Internet Access market is highly concentrated. For all intents and purposes, this did not mean relying on the idealized competitive ‘market forces’ of textbook economics but the small number of companies that dominate the market. In Canada, this means the incumbent telephone and cable companies that control 95% of the Internet access market. More specifically, it refers to the ‘big six’ entities that account for well-over two-thirds of the market alone: Bell, Telus, Shaw, Rogers, Quebecor and Cogeco. The Conservative Government’s relentless pressure on the CRTC to rely on “market forces” to the fullest extent possible essentially gave the ‘big six’ a green light to do as they please because, by and large, they are the market. It should not come as a big surprise that they took the cue and ran with it. Bell took the lead, shutting down unlimited Internet plans and imposing bandwidth caps and so-called “excess usage fees” in late 2006, before removing unlimited Internet service as an option for new subscribers altogether in February 2007 (see UBB Telco Appeal at para 10) . Once Bell had established the new benchmark, and made it stick, the other players soon followed suit. This is not at all surprising because in highly concentrated markets, the small number of rivals that do exist tend to move like a flock, mimicking one another’s behaviour and competing on the margins rather than in a forceful way. Last month’s UBB decision was merely the coup de grace, sweeping aside the final hurdles to the big six’s plans to impose their provider-controlled Internet model on the rest of the population through the wholesale rates they charge independent ISPs that use their cables and wires for ‘last mile’ access to subscribers homes – all with the blessing of the CRTC. The telephone and cable companies argue that these steps are necessary to curb the minority of excessive users who consume a disproportionate amount of traffic on their networks, leading to congestion. Yet, such claims are circumspect. First, because the only thing that has grown faster than the 40-50% year-on-year increase in Internet use over the past decade has been the rate of growth in network capacity and the declining costs of network technology. Second, according to the CRTC, while the companies can use user fees, bandwidth caps, and other economic measures to manage traffic on their network, the priority is suppose to be on expanding network capacity through additional investment. To be sure, in absolute terms, the telephone and cable companies invest billions every year in upgrading their facilities. However, by international comparative standards, investment in Canada has been weak and, as the following figure shows, there is little evidence of greater investment following on from the Government’s directive to let the market rip. In fact, following a steep rise in the late 1990s associated with the dot.com boom, network investment by the telephone companies has stayed relatively flat. 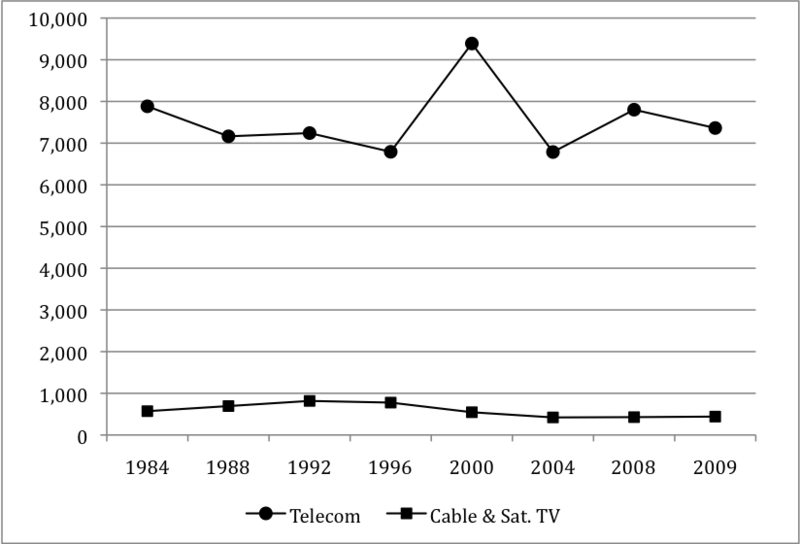 The cable companies investment levels actually fell significantly after 1996 and has stayed remarkably flat at relatively low levels throughout the past decade, despite the emergence of the Internet as a vast new source of revenue. One might have expected to see an upward swing in investment to meet the emergence of new needs and the new revenue sources. That does not appear to have happened. Source: Statistics Canada (2010b), Capital and Repair Expenditures – Broadcasting and Telecommunications (2001 – 1009) Cansim Table 029-0013 and Statistics Canada (2010c)Capital and Repair Expenditures on Construction and Machinery– Broadcasting and Telephone (1984 – 1993), Table 029-0033; CRTC (2002). Status of Competition in Canadian Telecommunications Markets. Third, there is no apparent link between the ‘excess usage charges’ that the dominant players are charging (i.e. from .50 cents per Gigabit (GB) to $5 per GB), and the cost of bandwidth. Experts peg the cost per gigabit as being anywhere between .01 cents and 10 cents. Even if we take the high end of this range, excess usage charges still entail an extortionate 500 to 5000 percent mark-up on costs. Finally, as the Organization for Economic Cooperation and Development (OECD) observes, Canada stands alone in terms of the near universal use of ‘bandwidth caps’ and excess usage fees for Internet use. Such measures are sometimes used in the US, but do not constitute the norm. Comcast, one of the largest cable companies and ISPs in the US offers a far more generous bandwidth cap of 250 GB per month than even the most expensive services available in Canada (except Telus’s most expensive service). Charges for ‘excess use’ are also non-existent. 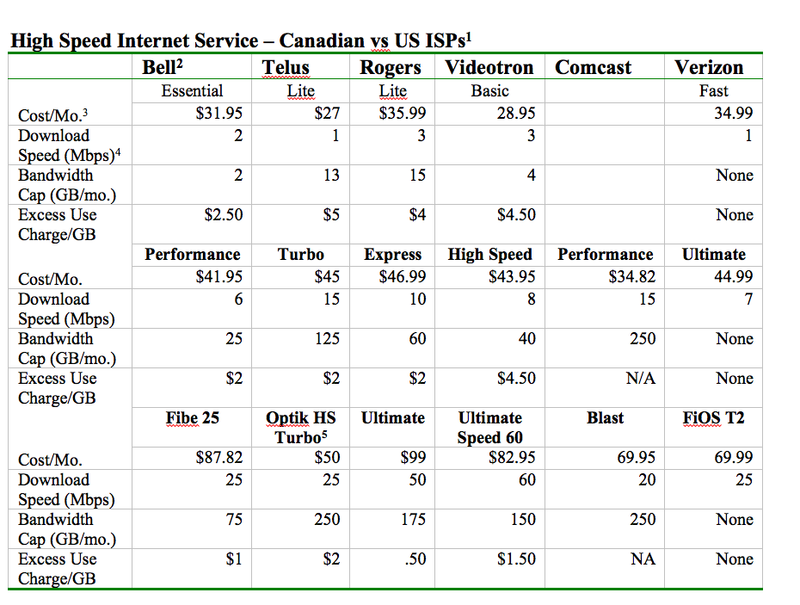 The following table offers a snapshot comparison between the four largest providers in Canada and two of their counterparts in the US. It must also be recognized that the comparison between the Canada and the US sets the bar low because neither country is a leader by comparative international standards when it comes to the Internet. Using a composite score based on speed, price and accessibility for wired and wireless networks, the Benkler Report (2010) ranks the US 13th out of the 30 OECD countries, and Canada 22nd. Both lag far behind leaders in the Scandinavian countries, France, Germany, Japan, and South Korea, among others. The Benkler report has been criticized in Canada and the US by some of the major players, but its findings are in line with most studies. In other words, it represents a consensus position, not an outlier. The key point is that while most countries are encouraging the use of the Internet to the greatest extent possible and doing their utmost to create a ‘digital media’ strategy, a combination of corporate strategy, incoherent government policies, and misguided regulation have done exactly the opposite in Canada. Sadly, as a recent survey indicates, 9-out-of-ten Canadians have no clue that their use of the Internet has been so heavily clipped by ‘market forces’: bandwidth caps, excess use charges, and restrictions on what people can and cannot do with their Internet connections in the major providers ‘acceptable user policies’. The general drift of events has been obscured each step of the way by what can only be described as UnBearably Bland CRTC decisions as well as Cabinet Directives and the dominant players’ own “acceptable use policies” that are hedged about by a thicket of techno-economic mumbo jumbo. The cumulative effect of which is to conceal how one foundational principle after another of the open, user-centred Internet has been laid to waste. The fantastic thing about last month’s so-called UBB decision by the CRTC is that it has helped to pierce through the veil of ignorance cultivated by the politics of a cozily regulated industry and shattered Canadian’s complacent delusions about the state of the Internet and Internet policy. If that is in fact the case, the ill-thought decision may ultimately serve a noble cause. However, we are going to have to go far beyond just the January 25th UBB decision to re-open all of those that preceded it, and that have had far more pervasive and now firmly rooted effects. There is, in short, a long slog ahead to undoing the state-sanctioned, corporate regulated Internet that has been put into place in Canada over the past decade, and especially the past five. Fortunately, the first steps are already well underway. As I write, the number of signatures on the ‘stopthemeter’ petition launched by the advocacy group, Open Media, has soared past 420,000. The NDP and Liberals have both blasted the UBB decision. A private citizen, Jean-Francois Mazei, with a stake in these affairs from a business (he is the owner of Montreal-based ISP, Vaxination Informatique), political and intellectual point of view, has had his petition to overrule the UBB decision recognized by the powers-that-be, and widely circulated. The CRTC has also been given a stern public dressing down by Industry Minister Tony Clement, initially by Twitter, and later by official press release, and then by Prime Minister Harper’s own tweet to the same effect. Many see this as a clear signal that the UBB decision will be overturned. The CRTC has got the message, but whether it will ultimately do the right thing is still an open question. CRTC chairman, Konrad von Finckenstein, told a hastily convened session of the Standing Committee on Industry, Science and Technology last week that he had already ordered a review of the decision and delayed its implementation for two months. A further two-month extension was made February 8. However, his advice to people to “shop around for a plan that best meets their needs” and staunch defense of the pay-per Internet model that he has been pushing, as if the market is competitive and the internet just another commodity, should give pause for doubt that the CRTC can lead the kind of thorough-going review that is needed. If the aim is just to overturn the January 25th UBB decision, we should be careful what we wish for. If, however, this is just a stepping-stone to a far-reaching review of the step-by-step strangulation of the Internet that has taken place over the past decade, and especially the past five years, then we will have cause for joy. Prices for each service is for standard rate versus temporary discounted promotional rates. Figures collected February 8, 2011. Excess use charges to first 300GB for the Basic and Express versions, $1/GB thereafter. Prices expressed in Canadian dollars. Based on advertised rates for unbundled Internet access. Each ISP indicates that download speeds fluctuate. The figures here are the maximum speeds. Only available bundled with TV service.